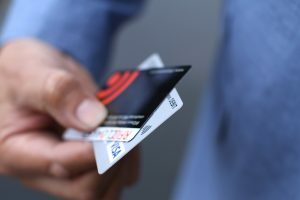 Eliminate the threat of data theft or fraud to your ID, contactless and credit cards with our ultra-thin flexible RFIDsecur™ contactless blocking protection card. The thinest, lightest, most effective flexible contactless RFID blocking cards made from our RFIDsecur™ film will soon be available online to order. Protect your contactless bank cards and RFID security passes and keys from being copied and scanned. At 270 microns thin (0.27mm, contactless bank cards are 760 microns or 0.76mm) these ultra thin RFIDsecur™ cards are 1/3 the thickness of your bank card. will protect all your contactless and RFID cards including security passes and keys. No other RFID blocking cards protect against both 13.56Mhz (bank industry standard) and 125Khz (security and key pass standard) frequencies. If your bank card has the contactless payment symbol similar to the one here, you should consider protecting it from the possibility of unauthorised or accidental access, which could lead to identity theft and financial loss. RFIDsecur contactless blocking cards can be placed alongside your contactless bank card, in your wallet, purse or ID holder, guaranteeing protection against theft of your information or unauthorised payments whilst still allowing you – and only you – full use of your cards. After successfully being funded through Kickstarter crowdfunding, and delivering our backers rewards, our first batch of production RFIDsecur™ contactless blocking cards will soon be available from us direct. We're preparing our next Kickstarter campaign, a radical new wallet....join us?